Apple today announced that its retail store at Meadowhall in Sheffield, United Kingdom reopens Friday, September 22 at 9:00 a.m. local time. The store has been closed for renovations since November 2016. A source tell us it will be a double-height store with a mezzanine level and at least twice as much space, all in the same location as the original. An updated design will include large glass doors, sequoia wood tables and shelves, a large video screen for Today at Apple sessions, and light boxes spanning the ceiling. The grand reopening will coincide with iPhone 8 and iPhone 8 Plus launch day. Friday is the first day the new smartphones can be purchased in stores. Thursday will likely be the last business day for Apple's temporary store at Meadowhall that has been open during the renovation process. 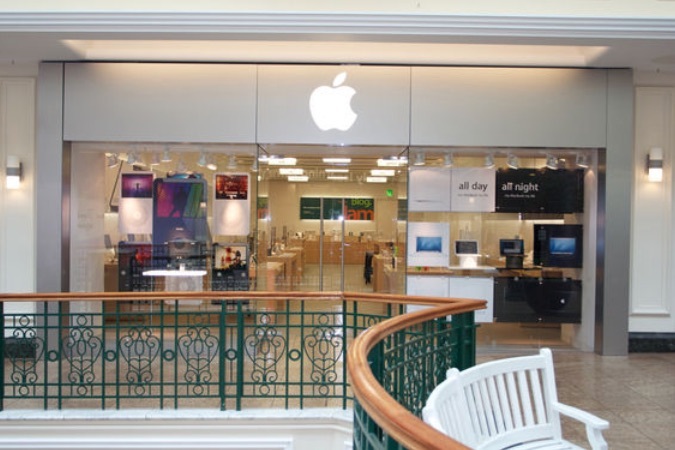 Apple has been a retailer at Meadowhall since December 2005. Apologies for the late reply, this was an image from opening day of the new store. Ironic that the stores are getting bigger now that the stuff Apple concentrates on selling is getting smaller. Good memories of this store, which has helped me and my relatives with various hardware problems over the years. Most recently helping my Mum with a broken iPad mini 4. Highcross, Leicester next please! That’s still one of Apple’s original (tiny) stores!! So... it's in it's original location then but bigger? Yes there was a fire escape. The fire escape has been moved around the store, looks like there is now one on each side. It will be at least double the space of the original. Yes, it does get very busy in there. From the article above, it suggests that the new one will be bigger though. I walked past it the other day, and it is a fairly wide space. Certainly wider than the temporary unit they are currently using. I assume that they have expanded into an adjacent unit, although my memory is a bit vague as to what used to be next door. Expanding into an adjacent unit is exactly what Apple did in the Trafford Centre, using a temporary unit elsewhere in the mall whilst the changes were made. Had made life a lot easier in there during peak periods.